As we slouch forward for long periods of time at desk jobs, our chest muscles become tight and short. This can pull our shoulders forward causing them to move off axis, increasing the likelihood of rotator cuff or cartilage damage and even leave the shoulders more prone to dislocation. A doorway stretch and foam rolling are great exercises to improve chest muscle flexibility. Where these exercises fall short, a physical therapist is a great asset to provide manual techniques such as myofascial release and massage to improve the soft tissue mobility and flexibility of muscles around the shoulder. Perform pec stretch in corner making sure to keep the neck in a neutral position to avoid poking the chin, and complete 3-4 sets of 30 seconds per set. 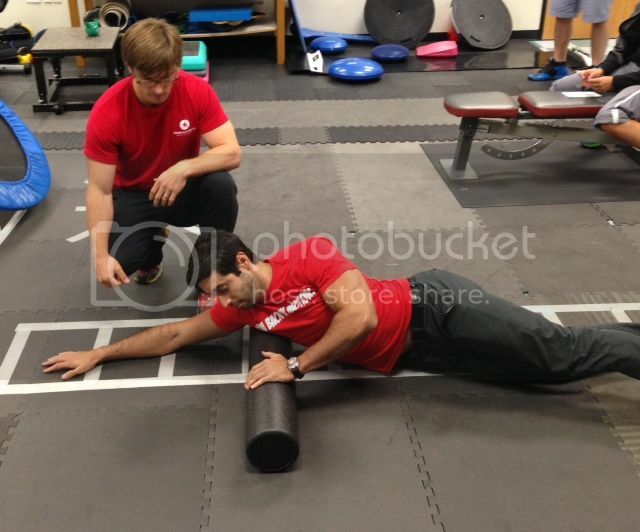 Perform foam rolling for 20 repetitions per side, making sure to avoid arching of the lower back. Again, these exercises are quite simple, but a physical therapist or athletic trainer can teach correct performance and make adjustments depending on your level of injury or fitness.